Experience the spectacular sunsets on the west coast of Koh Phangan island. The Sunset Hill Resort is located on a stunning hill and boast a panoramic seaview over the Gulf of Thailand, Koh Tao, Koh Samui and the Marine Park. Every apartment enjoys majestic ocean views from their luxurious bedrooms, kitchens, dining and living room and of course from the perfectly designed round terraces. Each Apartment is designed to optimize the coveted indoor-outdoor lifestyle, the unique folding doors can be fully opened, which will allow guests to combine the large terrace with the living room. The Sunset Hill Resort is located on a stunning hill 200 m above the Gulf of Thailand and within a short walk from the famous beaches of Haad ChaoPhao and Haad Yao. The main town and harbor of the island, Thongsala is located only 15 minutes from the resort and the famous full moon party is 30 min away. Taxi service to all destinations on Koh Phangan is available. The 2 bedroom apartments of Sunset Hill are ideal for families or groups of 3-4 persons who want to share an apartment together. 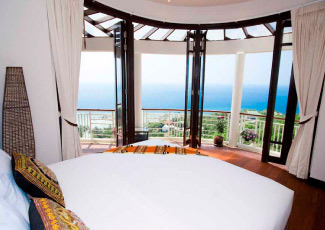 The master bedroom has an nice sea view on the Gulf of Thailand, Koh Samui, the Marine Park and a large terrace. The second bedroom has a fantastic forest and mountain view. By opening the folding doors you can extend the living room to the terrace. The apartments are equipped with a minibar, television and stereo set. When you rent an apartment you are also invited to use all the facilities of the Sunset Hill Resort, such as: a swimming pool, coffee lounge, all kinds of daytrips and diving courses, and of course massages! Massive enjoyment for the whole family or with a group! The Penthouse suite takes up half of the upper floor of each Sunset Hill apartment building (125m2). This ultimate luxury apartment is suitable for 2-4 persons and has two completely furnished bedrooms. The penthouse has a very big terrace which allows you to change the breathtaking view just by walking to the other side of the round terrace. Both from the living room as well as from the master bedroom you have a panoramic sea view on the Gulf of Thailand, the Marine Park and Koh Samui. The penthouse is equipped with a high end kitchen, 2 big bathrooms, a cosy sitting area, dinette, and electrical apparatus of high quality. A big flat screen television with DVD player and hi-fi stereo are also present. By opening the unique round folding doors you extend the living room to the terrace which gives you the ultimate outdoor lifestyle. When you rent a Penthouse you are also invited to use all the facilities of the Sunset Hill Resort, such as: a swimming pool, coffee lounge/bar , sauna, diving courses, tours and of course massages! The penthouse suite is ideal for honeymoons and getaways. All Rooms Rates is per room per night and EXCLUSIVE of breakfast. All room rates are in Thai Baht and INCLUSIVE of tax and service charges. Transfer from / to Thongsala Pier to resort is available when request directly with the resort at 200 THB. 50% Deposit payment is required and non refundable. Full prepayment is required and non refundable during New Year period. Extra Bed is 2000 THB per bed per nigh. for new year period, 1000 Baht for the rest period. only 1 bed /room maximum. Baby Cot is available at 600 THB per night for new year period, 300 Baht for the rest period. No charge for children under 10 years sharing a room with parents without extra bed. Safety deposit box is provided in every room or at the reception. Christmas Reservation: A minimum stay is 3 nights. New Year Reservation: A minimum stay is 7 nights, and arrival date on or before 27 Dec.
New Year: 100% prepayment is required and non-refundable.